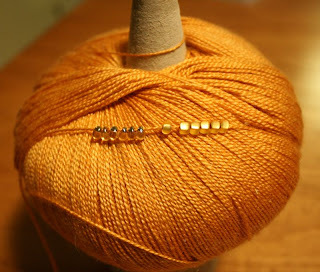 Which gold bead to use? Way way way far behind on my knitting blog. 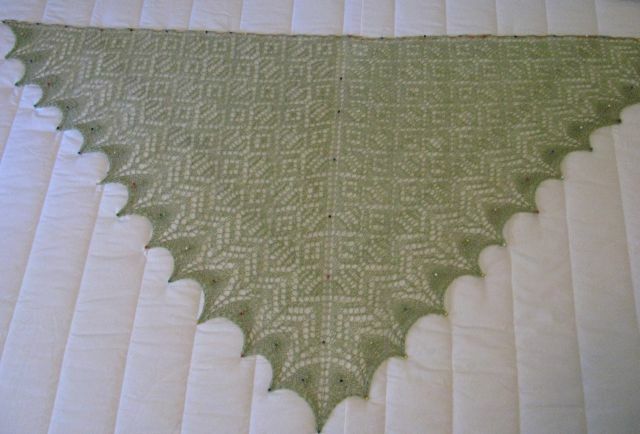 I'm learning lace knitting and having a blast making shawls. 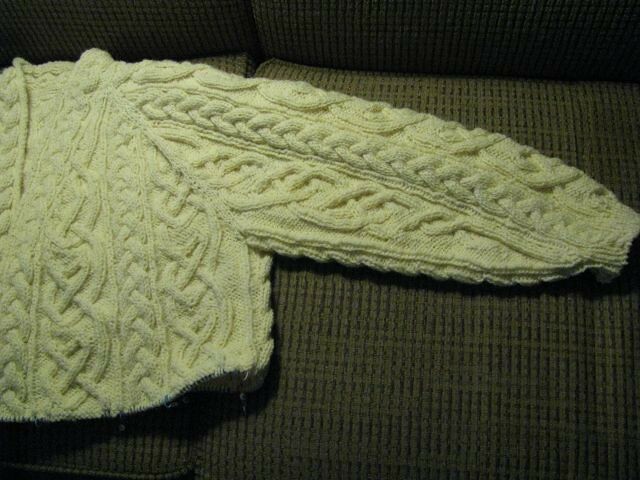 Aunt Cecil had given me a bag of Jamieson & Smith two ply jumper weight many years ago. She'd bought it while on a trip to Scotland with Uncle Bubba but never got around to using it. Kept thinking how much fun it would be to make her something from the yarn. Not great photos and they show the shawls being blocked on a mattress. 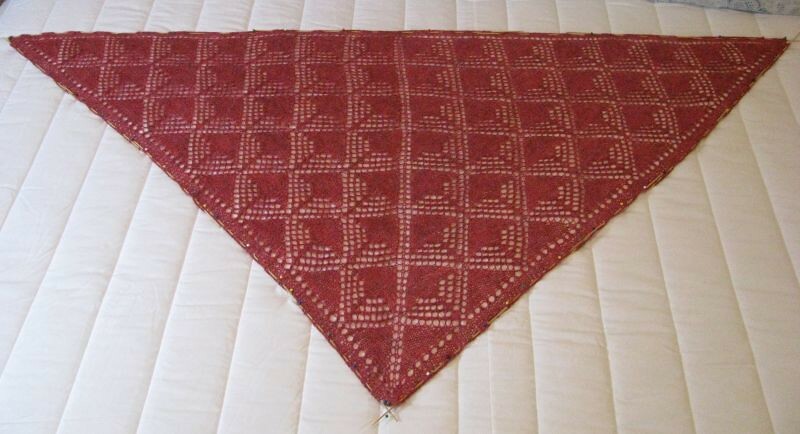 Next came Tibetan Beaded Shawl which was a bit more ambitions and included beads. 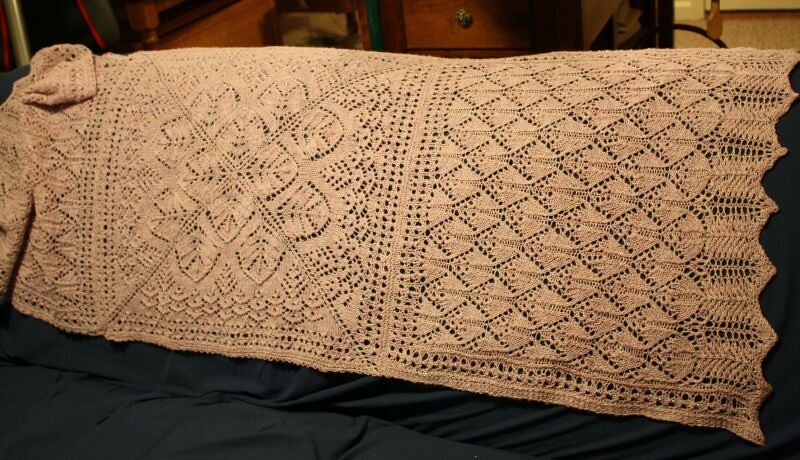 The shawl is rectangular and actually is a light lavender not pink. They sure are fun to make. 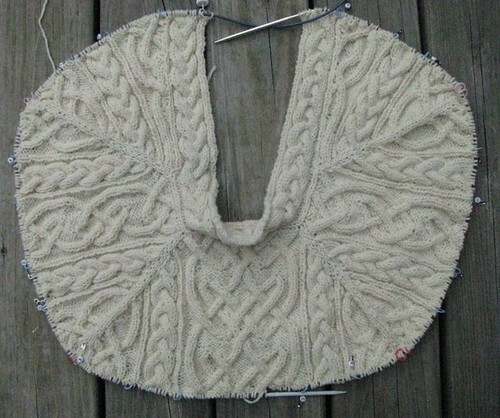 Also currently working on another shawl and a top down Alice Starmore sweater called "Irish Moss" for an online Knit Along on Ravelry. I'll catch up the other stuff later. 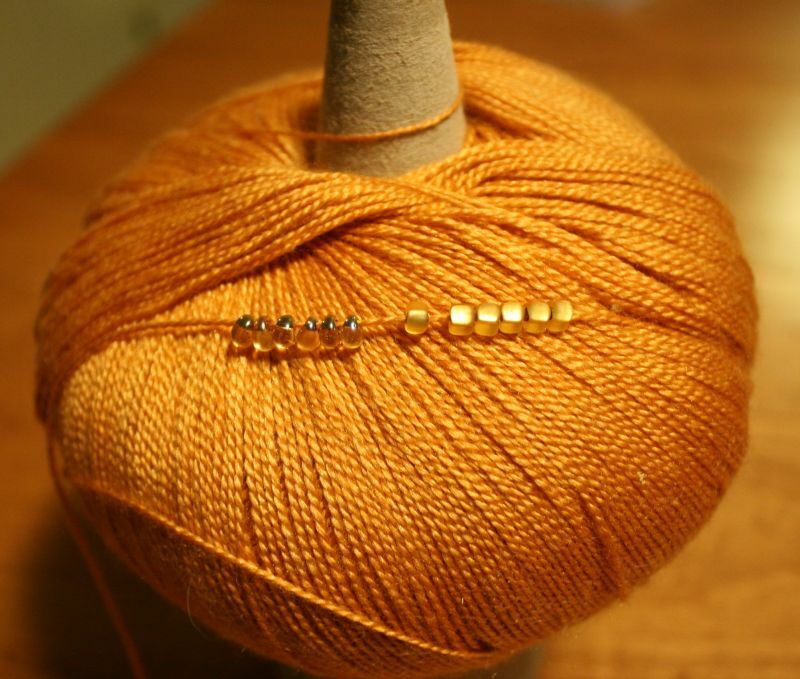 Temperatures hitting 88-95F are not exactly friendly to knitting worsted weight. St. Margaret is in hiatus until the temps drop a bit. 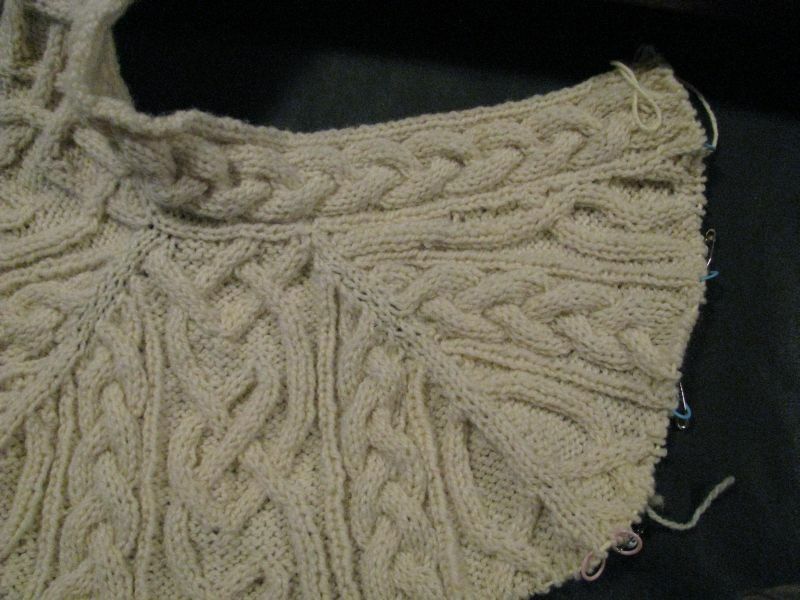 The first sleeve is done and the second was down to the wrist ribbing. Had to rip that back as the decreases weren't matching the other sleeeve and my notes were poor. Note to self "make better notes"! This is first sleeve done. 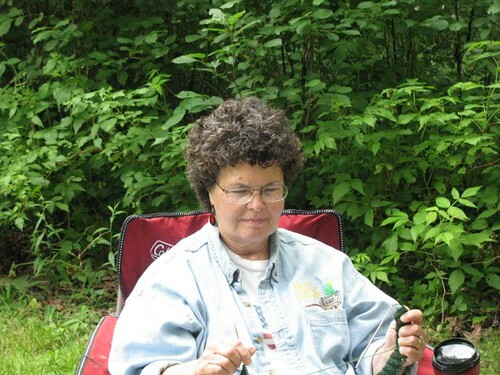 On a recent short RV trip up to New Brunswick, we camped at Cobscook Bay State Park. 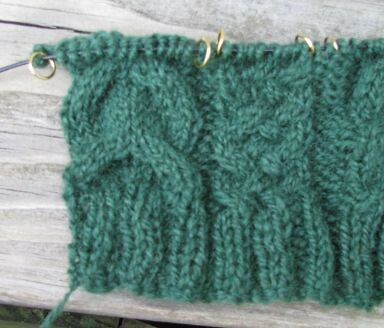 Knitting at Cobscook Bay State Park beside the ocean, breezy and not horribly hot was great. 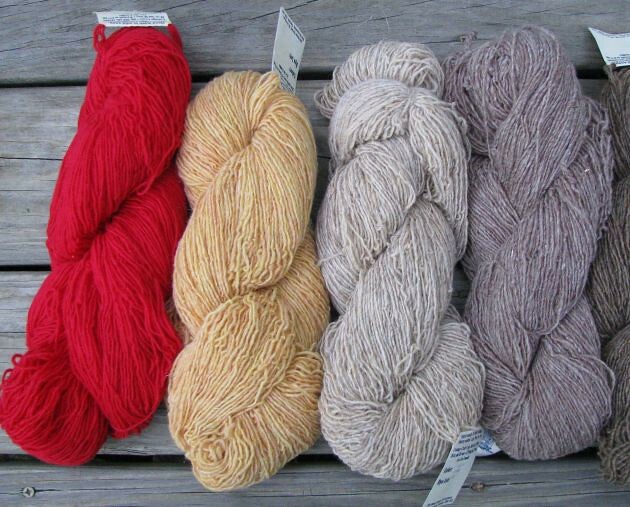 We also camped in St. Andrews and visited Cottage Craft yarns to fill in colors on the one ply for stranded work. 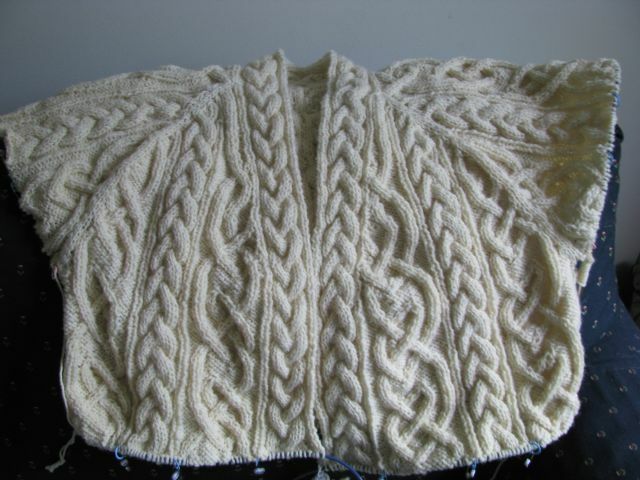 I'll be knitting along with BlueDragon (Helen) on her Ingvold Aran KAL which is happening until we start a KAL out of the reprint of Alice Starmore's "Aran Knitting" this fall. I've taken her charts and using a simple hat to check the gauge. 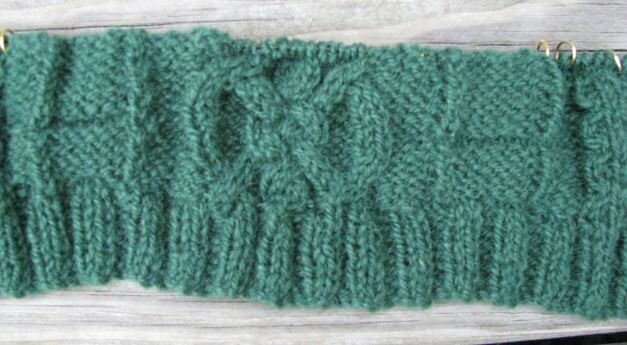 I'm using US#4 needles and Halycon Victorian sport in a forest green. 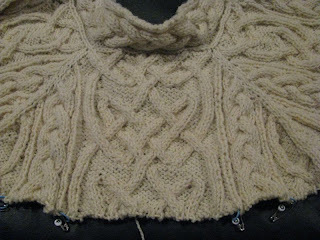 Still having fun knitting away on Jeri Riggs' "St. Margaret" design. 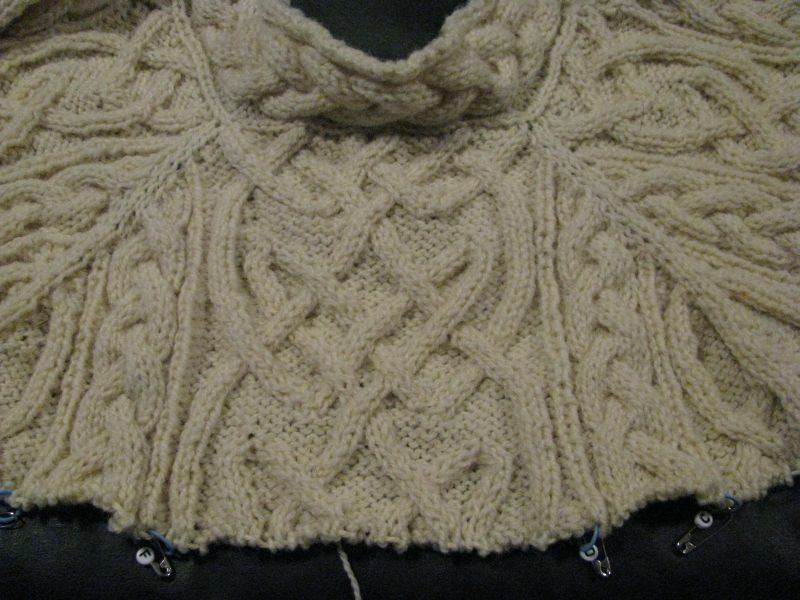 Body is done from neck down to two chart repeats below armholes. 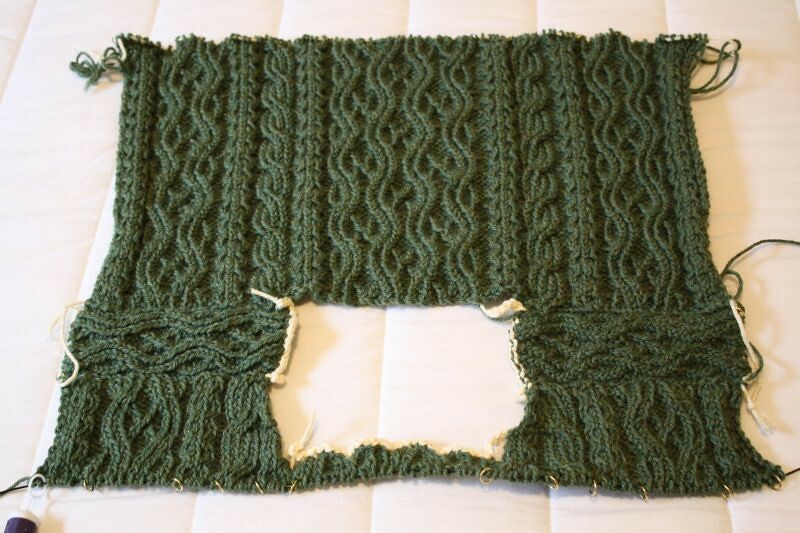 First sleeve is 35 rows down. 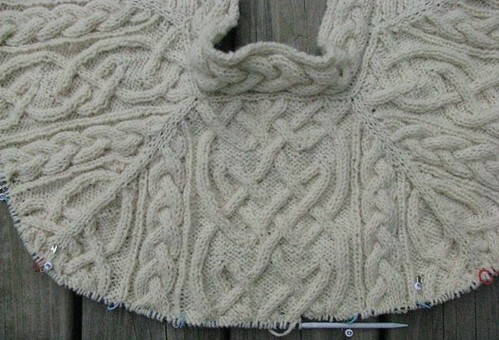 It fits beautifully which is one of the reasons I like top down raglan sweaters so much. 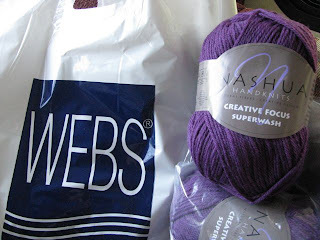 On a recent RV ramble through NH and VT, I sort of convinced Joe to wander down into MA to WEBS, a huge yarn warehouse. 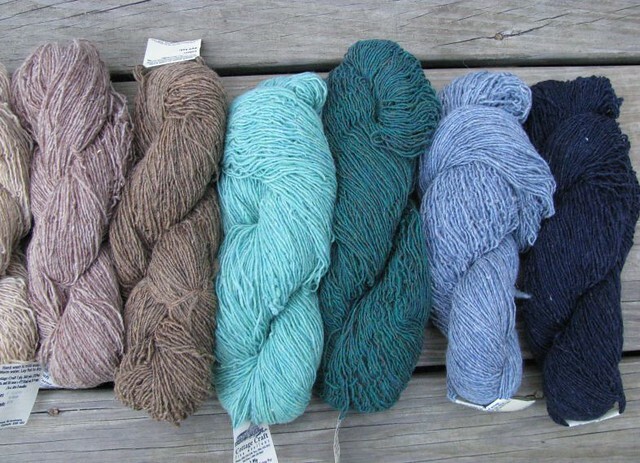 There is a "Grandpa's Attic" area of orphan yarns, not enough to sell in the catalog or on the floor anymore. This place is amazing and I'm glad it is four hours away. 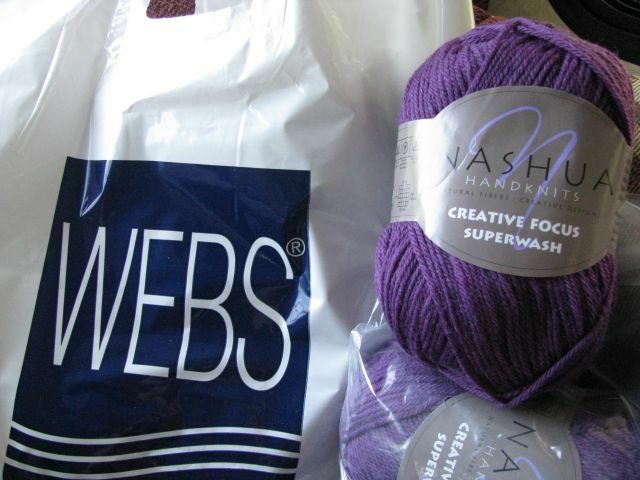 I did pick up some Nashua superwash worsted in a deep purple. It will probably be used this fall in a Starmore KAL top down. Gardening continues with lots of recent rain so the weeds are happy. 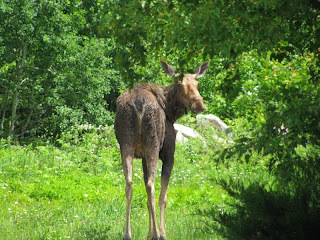 We'd just come into the sunroom for a rest and Joe said "Oh look at the moose!". I went, yeah sure until I went to the window. She was HUGE and just sauntered around the yard a bit before disappearing into the woods on the other side of the road. Sure would hate to come face to face with her in the dark.